NBC Charlotte was live on the air when one of our crews came upon the scene of the accident near Matthews Sunday afternoon. 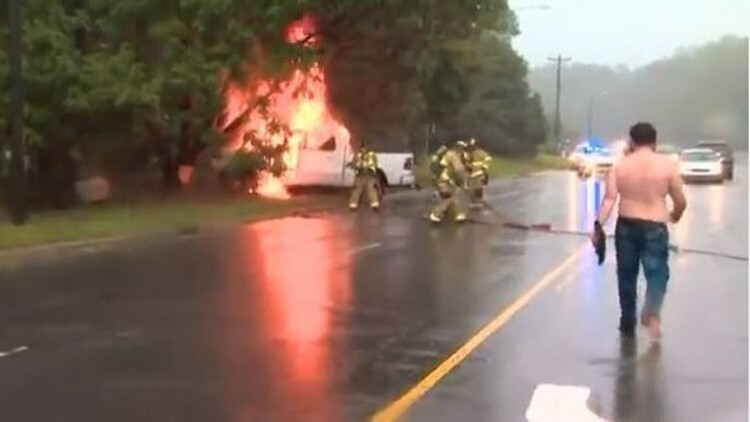 NBC Charlotte was live on the air when one of our crews came upon the scene of a truck that hit a tree and caught fire near Matthews Sunday afternoon. It happened on Pineville-Matthews Rd. near Elizabeth Ln. Before first responders arrived, some good Samaritans pulled the victim out of a window before the truck went up in flames and applied a tourniquet to his leg, using a shirt and a belt. The victim broke his leg but was alert and talking to emergency workers, according to the victim's brother. It's believed the driver of the truck hydroplaned, lost control and hit the tree.